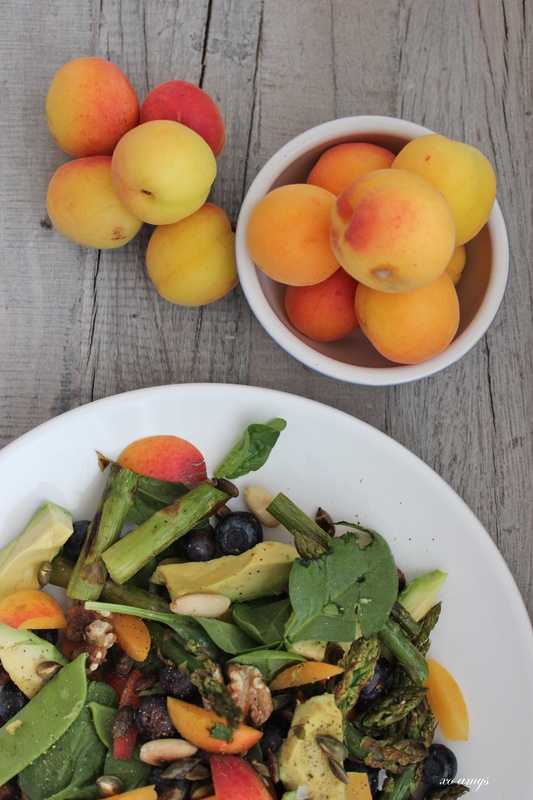 This salad symbolizes sweet succulent summer days that is vibrant in colour and refreshing in taste. 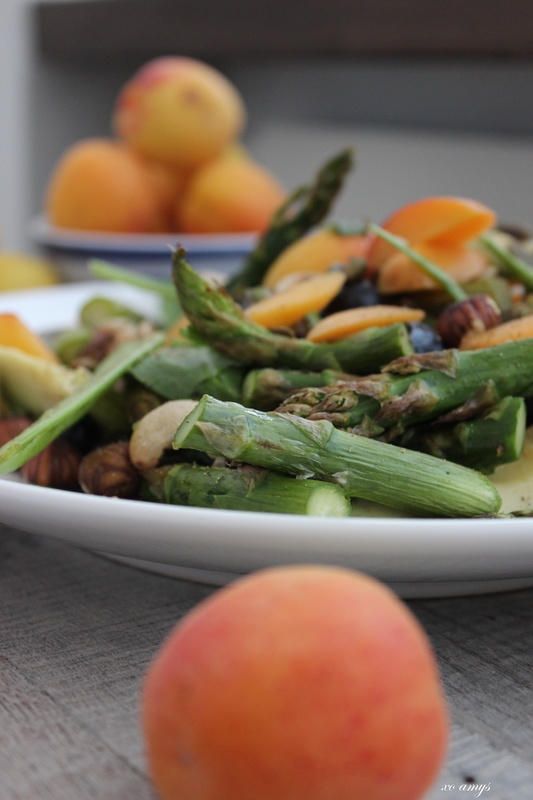 It has a nice fruity flavour to it where the nuts and asparagus add a salty crunch. Crumbled feta also works greatly in this and makes it more filling. 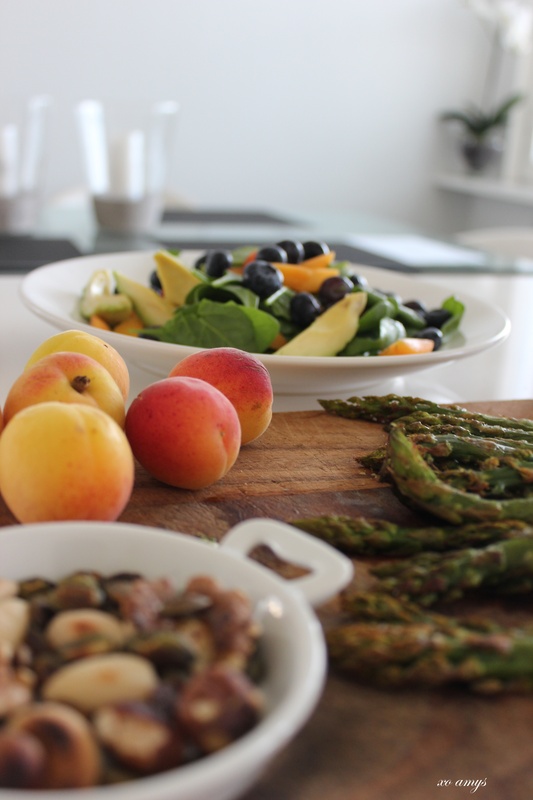 The mixture of textures makes a fun combination and a fresh change to ordinary salad leaves. 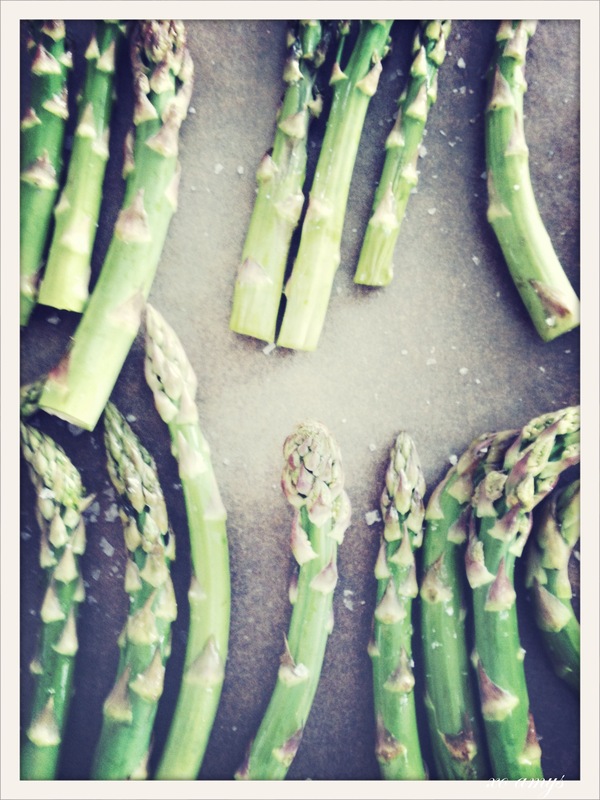 Prepare the asparagus by discarding the hard ends and peeling any tough skin away. The ones I used were thin and quite delicate, so I just sliced the ends (a generous amount) so no peeling was needed. 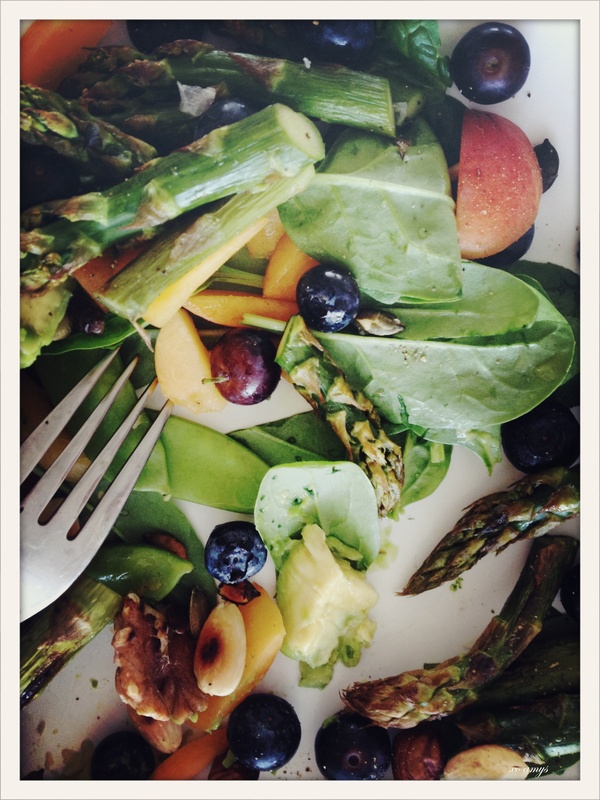 In a bowl mix the asparagus with olive oil and place on baking sheet. Sprinkle finger salt. Place into a hot oven (200 C) for 5-7 minutes so they golden. Remove from oven and leave to cool. Toast a variation of nuts and seeds in a saucepan with a pinch of salt. Let them golden and leave to the side to cool. 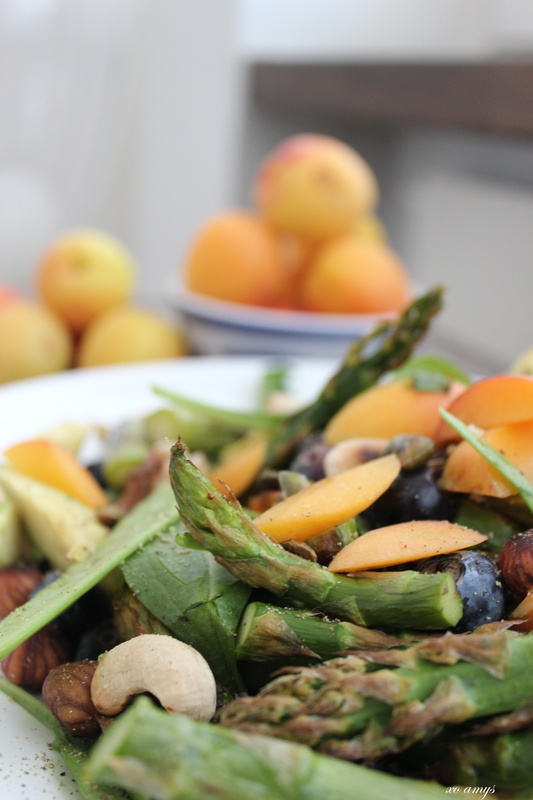 Slice the apricots, avocado and cooled asparagus. 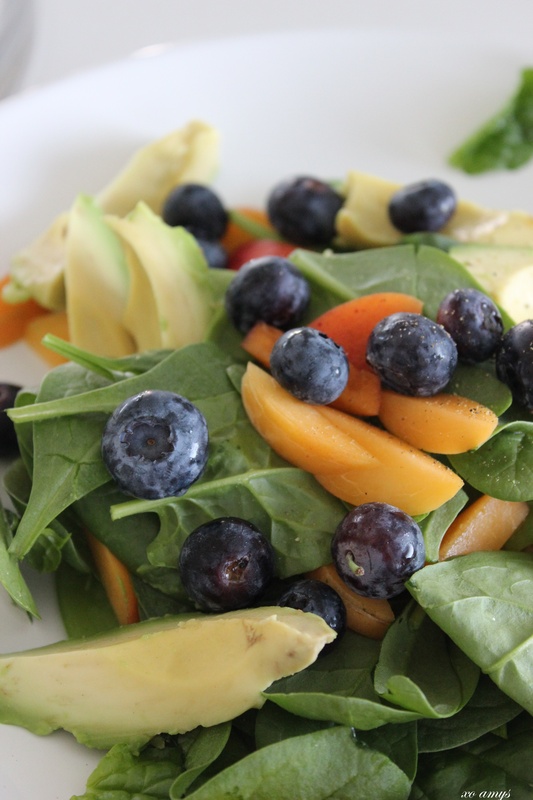 Add the peas, spinach leaves, blueberries and ground black pepper. Sprinkle herbs of choice on top. I will definitely have to try this! Always looking for new salad combinations. Hey! well that’s great, I’m glad I inspired someone to try it 🙂 I think it’s the mixture of tetures that makes this salad unique, especially the sugar peas!